Do you have out-of-town guests visiting during the holidays? We can have guests at any given time, but the holidays can bring guests more than any other time of the year. I admit I don’t get many overnight guests, with the exception of my parents, but it’s important to me that my guests feel comfortable. I even want them to feel pampered. Guests should feel like they’re at home. Even though I may not give my guests turn-down service or chocolate on their pillows, I want them to feel like they’re wanted. So whether it’s a monogrammed blanket, a bamboo towel set in the guest bathroom, a bedside water carafe, or a mattress topper (which I highly recommend), make your guests feel special while they are in your home. What do you do to make overnight guests feel welcomed? I never thought about a luggage rack, but that is so convenient for me in hotels that I know it would be appreciated at home too. Great idea! That gorgeous pillow is just my style! I love clean and simple styles and colors. I love having extra blankets. Thank you for sharing this list with us. 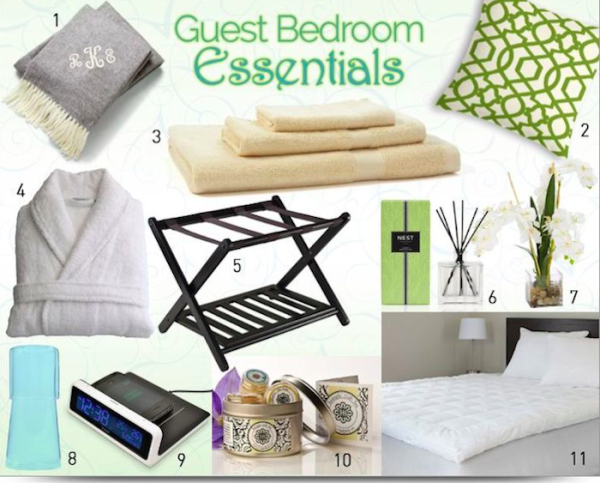 I’m loving these essentials, I need to redo my guest bedroom. Unisex bathrobe and Reed diffuser are what I’m missing. Need to get them instantly! Love the idea of a luggage rack. I really like that luggage rack! And the throw pillows are adorable! Such wonderful ideas for creating a welcoming retreat for guests! I’m going to apply some of these ideas before our holiday quests come to visit. Make room; I’m inviting myself over! All of the essentials would make me feel so welcome. I would definitely be impressed if I saw those in a guest room. The Wireless charging station and clock are a great idea. I have a box of tissue on the nightstand for our guests, and that’s about it. I apparently need to step it up a notch. I don’t have a guest room but I really do love the idea of having a luggage rack for when my guest comes to visit! I’ve been wanting to try Bamboo towels. They look so soft. That mattress topper looks heavenly! Great ideas for guestrooms! thanks fort the ideas! Had no idea about the luggage rack but hindsight would make sense. I don’t get a lot of guests but when I do want them to feel comfortable and all the comforts of home. Those really are guest bedroom essentials. I need to get some of those for our guests coming for Christmas. We don’t have a guest bedroom per say, but we did just add a fourth room so each of our children could have their own room, and we can easily rearrange them for a few nights to accommodate guests.